Last updated December 6, 2006. Alamin GSM SMS Gateway is a gateway for exchanging messages between GSM and IP networks. The main objective of the gateway is to provide a reliable delivery service and conversion in both directions in order to extend to the GSM network the functions of IP-based applications. To make an analogy, it's like a web server for HTML pages. They need the web server and provide it with content. 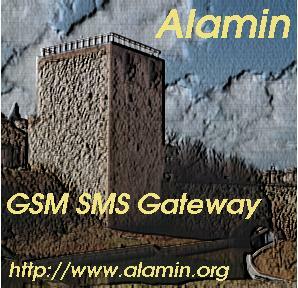 The Alamin Gateway paves the way for all types of mobile applications on GSM using SMS messages. One very common use for the gateway is to send an alarm from a computer network to its system administrators. Another is the currently common apps showing tv viewers comments on tv programs. Currently, the connection to the gateway from the IP network can be achieved using SMSQP (11201), the native protocol of the gateway for sending messages and managing the queue. The SMSQP protocol can be used directly or through the "gsgc" client. Implementing a SMTP interface is easy configuring your MTA for calling a script that prepares the message and calls "gsgc". The connection between the gateway and the GSM network can be realized through a GSM modem or through a telephone supported by the project Gnokii. A SMPP connector is being developed these days. At present, only GSM modems can be used in "text" mode. In the future, "pdu" mode will also be supported. Not all devices support both modes, so that you will have to read the manual of your mobile telephone or GSM modem and consult the GSM devices page. Alamin is developed on Debian GNU/Linux but runs almost in all perl enabled systems. The program isn't finished yet. All its intended functionality hasn't been implemented, but the program is useful and very stable. Stability and security of the gateway are the primary objectives. Installations have been running in Spain since May 15, 2000, and there are a lot of real installations around the world. See the "who use" page. The documentation is rather scarce, so that the best source of information are the comments in the daemon config file (gsgd.conf) and the user list alamin-user@lists.sourceforge.net. If you have any questions, please write to info@alamin.org or to one of the distribution lists.